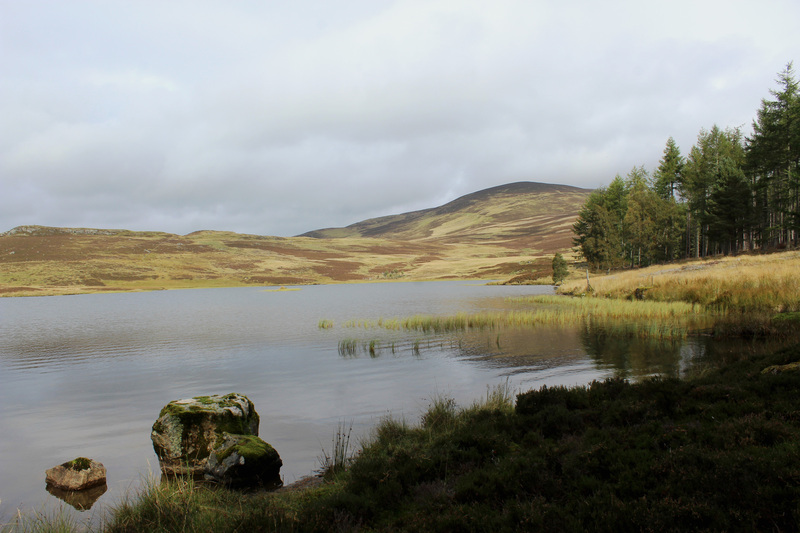 After a summer spent tramping the hills I decided to treat myself to new boots and, to break them in, settled on a walk to Auchintaple Loch, a secluded stretch of water hidden away in the folds of Glen Isla. Fringed with pine and larch, the loch’s natural beauty belies its artificial origins – it was created in the Victorian era for fishing. I began my outing in the hamlet of Folda where there is space to park opposite a red telephone box. The kiosk’s days are, however, numbered. With few calls made from this remote outpost, BT are planning to remove it in the near future unless it is adopted by the local community. Answering the call of the great outdoors, I left the box to its uncertain fate and hiked up the glen, a short road walk connecting me with the Cateran Trail, a long distance path that I planned to follow initially. Rising steadily from a gate and ladder stile, the waymarked trail curves up below a plantation before crossing open moorland with views north to the wilder, more mountainous upper reaches of Glen Isla and south, across the valley, to the unmistakable form of Mount Blair. 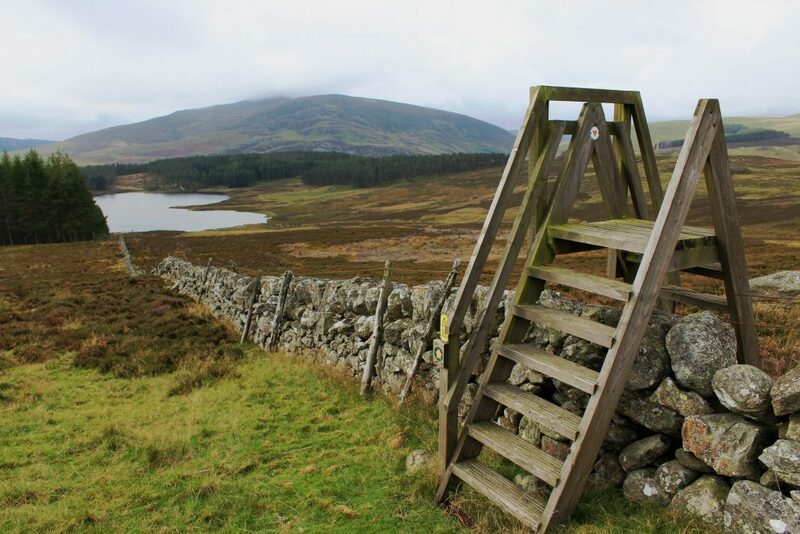 Ahead of me, below Badandun Hill, the track forks and, turning east, I caught sight of Auchintaple Loch as I passed between a pair of old metal gate posts devoid of either gate or fence. While the water lay down to my right, I still had some climbing to contend with before I reached it, the track ascending to a gate and stile on the shoulder of Badandun Hill. Above me, a herd of red deer roamed across the skyline, far enough off not to be troubled by my presence. 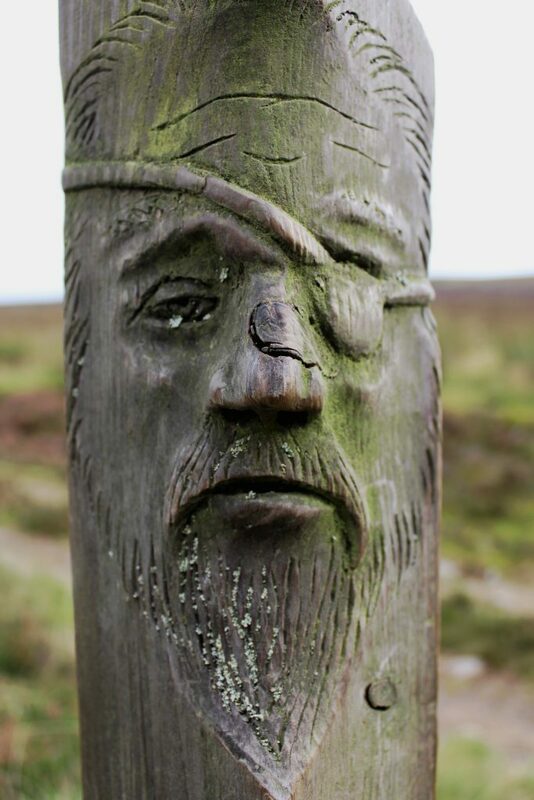 Staying on the Cateran Trail, I descended towards a plantation, entering the trees below a marker post into which the gnarled faces of caterans – marauding cattle thieves who plundered the rich grazing lands of Angus and Perthshire during the Middle Ages – are carved. Eying them warily, I looped down through the dark, mossy forest, hoping not to bump into any such menacing characters. Thankfully, my route was clear and soon tantalising glimpses of water filtered through the trees. Emerging from the plantation, I branched off the Cateran Trail, a grassy path dipping to the loch and its outflow, a relatively easy crossing thanks to well-placed stones and a fence panel. On the other side of the stream, a heathery promontory enjoying the shelter of Scots pine trees is a delightful place to pause and savour the lochside setting before crossing the embankment dam on a path that runs along the shoreline to a quaint little boathouse. 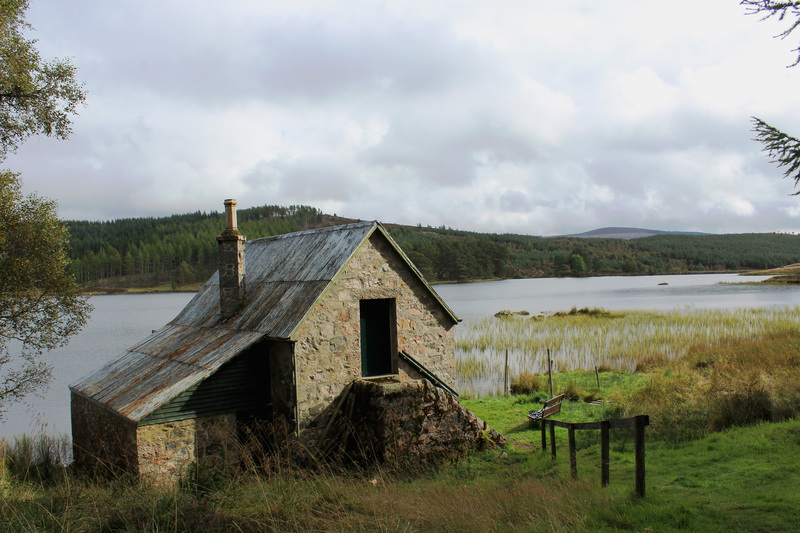 Loch and boathouse date from the 1880s and, well over a century on, Auchintaple remains popular with anglers, trout the sought-after catch. Above the jetty, I headed south into woodland, the track rising gently before curving left. Here the terrain was rougher underfoot, the route, which skirts around a mound on the right, churned up by forestry vehicles. My fresh out of the box footwear took a bit of a bashing but, bearing right at a T-junction beyond younger trees on the right-hand side of the track, the trail improved and I enjoyed an easy descent into the glen, a short road walk returning me and my broken in boots to Folda. Walk 300m north along road. Go right through metal gate (signed for Glen Prosen) and ascend track. Where main track swings right, continue straight ahead on grassy track, rising by plantation and passing through gate. Where track forks, go right, dipping to cross moorland before ascending to gate and ladder stile. Cross stile and, at junction beyond, turn right and descend track to gate and stile on edge of plantation. Enter woodland and follow track down through trees to gate and stile. Just ahead of the stile go right on grassy path descending to Auchintaple Loch outflow. 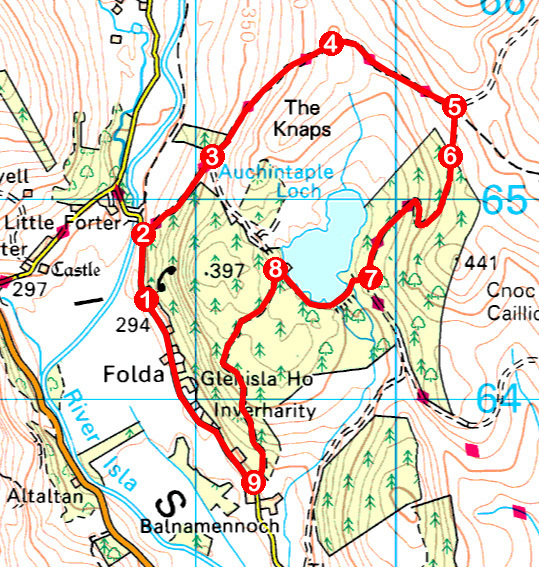 Cross stream at wood and wire fence panel, branch left and follow path around loch, passing through two high gates, to boathouse. At junction above boathouse, go left, passing through high gate, and follow track south-west then south to meet road beyond two metal gates. Turn right and follow road north to Folda.